Feb 9 – St Apollonia of Alexandria, (d. 249 AD) – Virgin & Martyr, Patroness of Dentistry | ADULT CATECHESIS & CHRISTIAN RELIGIOUS LITERACY IN THE ROMAN CATHOLIC TRADITION: hosting ONLY True Christians!! !, or "How to think Catholic!!" Recently, our financial advisor here in Madison requested prayers for his son, Ethan, 9, as he was to have certain remaining child teeth, having not fallen out naturally, removed to make room for adult teeth. We did offer prayers to St Apollonia on that weekend for Ethan. Saint Apollonia was one of a group of virgin martyrs who suffered in Alexandria during a local uprising against the Christians prior to the persecution of Decius. 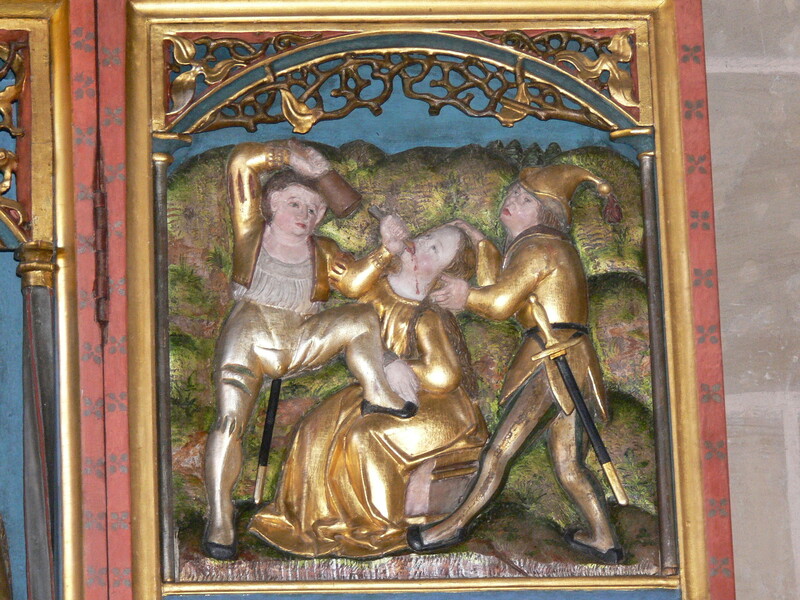 According to legend, her torture included having all of her teeth violently pulled out or shattered. For this reason, she is popularly regarded as the patroness of dentistry and those suffering from toothache or other dental problems. 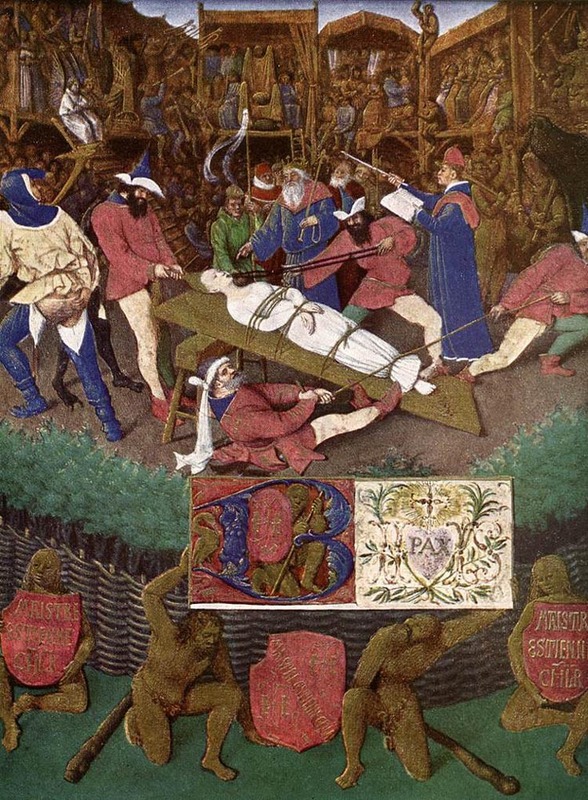 -French court painter Jehan Fouquet painted the scene of St. Apollonia’s torture in The Martyrdom of St. Apollonia, ca 1452-1460. Ecclesiastical historians have claimed that in the last years of Emperor Philip the Arab (reigned AD 244–249), during otherwise undocumented festivities to commemorate the millennium of the founding of Rome (traditionally in 753 BC, putting the date about 248), the fury of the Alexandrian mob rose to a great height, and when one of their poets prophesied a calamity, they committed bloody outrages on the Christians, whom the authorities made no effort to protect. The narrative of Dionysius does not suggest the slightest reproach as to this act of St. Apollonia; in his eyes she was as much a martyr as the others, and as such she was revered in the Alexandrian Church. 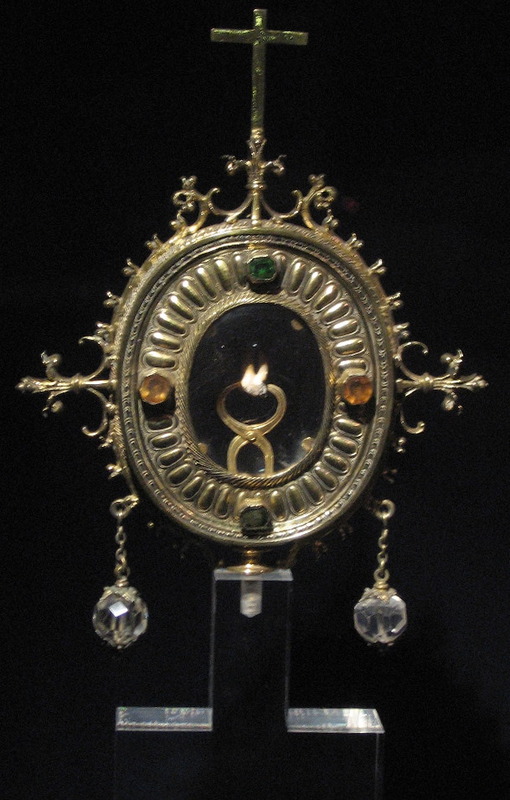 -Reliquary containing a tooth reputedly that of Saint Apollonia, in the Cathedral of Porto, Portugal. The island of Mauritius was originally named Santa Apolónia in her honor in 1507 by Portuguese navigators. 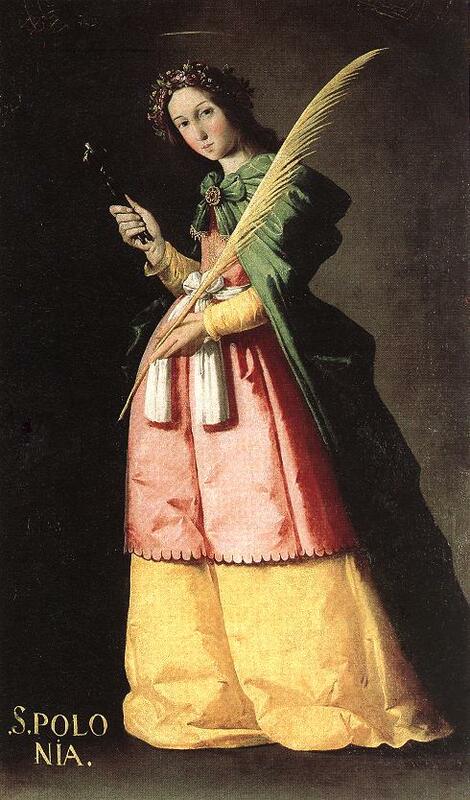 –Saint Apollonia, 1635, by Francisco de Zurbarán, Museum of Louvre, from the Convent of the Order of Our Lady of Mercy and the Redemption of the Captives Discalced of Saint Joseph (Seville, Spain). By diseases of the teeth.